For the agenda to be dispatched! Talk of mental illness is lies! Holloa, girls! Holloa, girls! Blame the guns now! Holloa, girls! Holloa, girls! Take them all now! With the recent abolition of the long gun registry, I expected the Dec 6 hullabaloo to be a bit more chaotic than usual this year. Surprisingly, it has been quite tame so far. I’m not naive enough to think we’ve heard the last of it though. The fourteen victims of Marc Lepine/Gamil Gharbi were killed on Dec 6, 1989 and their memories have been butchered all over again every Dec 6 since that date. Rather than using their deaths as a launching point to bring awareness to mental health issues and violence against all people, a handful of Feminazi activitists chose to turn those tragic deaths into a pulpit for gun control and violence against women. In a stroke, these misguided people drove an irreparable wedge between the sexes and alienated several million honest gun owning Canadians. Each year, vigils and forums are held to discuss violence against women. No doubt this is a worthy cause, but it’s irrelevant to the date. Yes, only women were killed that day, and yes, Lepine spoke openly about his anti-women beliefs. However, he could just as easily have fixated upon men, or children, or dogs. It just so happens that his mental illness manifested against women. That’s why the memorials on this day are so out of touch with the reality of what happened in 1989. Where are the focus groups and discussions on mental health? Where is the funding for community health groups that could have helped Marc Lepine before he went on his ramapage? Every year that we continue to focus on Marc Lepine’s victims rather than on the cause of his actions, is another year that the deaths of those women continue to have been in vain. Yes, there are still gender issues that need addressing, but Dec 6 is not, and never was about feminism or misogyny. Dec 6 is, and always has been, about mental illness. When are we going to stop dishonouring the victims of Ecole Polytechnique and finally address the real reason that they died? Has anybody else noticed the interesting use of language by the media lately regarding the gun registry debate? One of my personal favourites that is being bandied about these days is “sniper rifle.” The media and the Gun Control Lobby are telling us that there will be sniper rifles everywhere when the registry is destroyed. Too bad there’s no such thing. A sniper is a person, not a type of firearm. Simply put, any rifle that a sniper chooses to use, may be called a sniper rifle. Whether that rifle is a gopher gun or a military rifle, if the person using it is an expert marksman (sniper) then it could be called a sniper rifle. Similarly, many rifles are designed to shoot over 1km effective range. That does not mean that they are by their nature a sniper rifle. It is the skill of the shooter that determines whether it is one or not. The other term that’s a media favourite is “assault rifle.” Here’s a nice example for you. The M16 is a military rifle. The C8 is a variant of the M16 used by Canadian police forces. The AR-15 is a civilian variant that is hugely popular among sport shooters. The M16 and C8 are full-automatic – this means the gun will continue to fire as long as the trigger is depressed (commonly known as a “machine gun”). The AR-15 is semi-automatic – this means the gun will fire only one bullet when the trigger is depressed. Apart from this difference, they are all virtually identical. They all have a very similar muzzle velocity and effective range and all fire the same round. What’s my point, you ask? My point is this. Whenever the media writes about the C8 rifle, they will correctly refer to it as a carbine. However, when those same media outlets write about the civilian AR-15, they will refer to it as an “assault rifle.” If anything it’s an anti-assault rifle, but I digress. You will also see the gun used in the Ecole Polytechnique massacre, the Ruger Mini 14, being referred to as an assault rifle. It is, in reality, nothing more than a gopher gun. Why? Quite simply, the term “assault rifle” sounds scary to the uninformed public. They want to create an image of crazed gun nuts running around our city streets with machine guns. As I have illustrated many times before on this blog, the Gun Control Lobby knows they have no facts to support their cause, so they hope to sway people with emotion instead. It would be nice if the media would remember that they are supposed to be objectively reporting the news, not helping lobby groups to create it. This is an excellent editorial by Lorne Gunter at the National Post. He perfectly summarizes one of the core issues of the gun control debate in Canada. On Tuesday morning, members of the National Post editorial board – a group that includes me – got into a fascinating email debate regarding the federal government’s decision to decommission the long-gun registry. We then segued into a discussion of the possibility of increasing restrictions for several makes and models of rifles that the previous Liberal government had deemed non-restricted. I do not own a gun. I have never owned a gun and can’t imagine I ever will. As objects of utility or recreation, guns hold little fascination for me. My interest in guns is purely philosophical: I can’t trust any government that doesn’t trust my law-abiding fellow citizens to own whatever guns they want. It’s the instinct to ban – rooted in the notion that governments or “experts” know better than we ourselves what is best or safest for us – that scares me far more than the thought of my neighbour owning a sniper rifle. The banning instinct is never slaked. Once it has succeeded in prohibiting guns, it will turn itself to offensive speech or unhealthy food. Even the notion that there are guns that can be readily identified as a “sniper” or “assault” rifle is specious. There is no definition of either that would be useful at law. Every country that has ever imposed a ban on certain types of rifles has encountered the same problem: It is impossible to define which rifles are safe for civilians and which are too dangerous, based on muzzle velocity, barrel length, bullet calibre, scope, etc. So in the end, each jurisdiction (Canada included) has been forced to resort to arbitrary and irrational criteria, such as that one model looks scarier than another. Typically the more military a rifle looks, the more likely it is to be banned, even if it is not operationally one bit different from a civilian “hunting” rifle. The concept of “need” is antithetic to freedom in a democracy where the citizens are sovereign. No one needs a car that goes more than 110 km/ hr, because that is the highest speed limit in the country. So should any of us who want to drive more than a Smart Car or Fiat have to go cap in hand to a government official and explain our “need” for, say, a sports car, before we are granted the right to buy one? Many more Canadians – thousands more – are killed by speeding automobiles each year than by high-powered rifles that are beyond what ranchers “need” to kill coyotes. If you are guilty of no crime, what you “need” is none of my business, or the government’s. In fact, it is the reverse. Any government that seeks to restrict the liberties of law-abiding citizens should have to prove it needs to do so, and that it is not just pandering to popular emotions and political sentimentality. One editorial board member said he would feel completely “free,” even if he were prevented from buying a high-powered rifle. But it’s easy to give up a liberty that is unimportant to you. The reason we non-gun owners should stick up for owners’ rights is that someday it may be our rights that are under attack. Someday, the banners who are going after guns may decide that eliminating hate speech (as they define it) is more important than defending free speech. And if we free-speechers don’t stand with gun owners against the banners today, why would the gun owner stand with us tomorrow? Debate over Bill C-19, which would finally end the contentious long-gun registry, continues to grow heated in both Parliament and in the press. The Coalition for Gun Control and their supporters have their backs to the wall and are throwing everything they can at this issue. 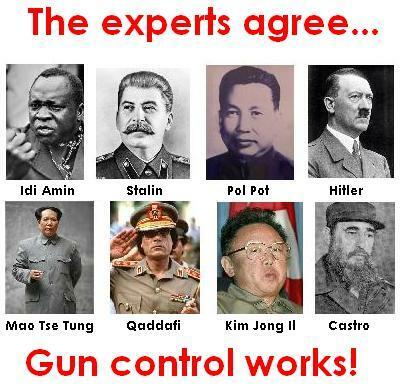 Don’t let the shrill fear-mongering of the Gun Control Lobby fool you into thinking otherwise. The two points above are the only changes made by Bill C-19. There are no reclassifications (that favour either the Gun Control Lobby or gun owners), there will be no “delisting” (whatever that means) of sniper rifles, there is no anti-women rhetoric, there will not be blood in the streets. These claims are simply the death throes of a vocal minority who no longer has the ear of the government. The Gun Control Lobby knows they cannot stop the passage of this bill. They know that point #1 is a done deal. Their goal now is to try to prevent the destruction of the existing information. Why? The only coherent arguments that have come out so far in support of keeping the data, is the old “the money has already been spent” line, and Quebec’s interest in maintaining a provincial registry. They say it would be too costly to start a new database from scratch, so they want the Federal government to hand over the existing information. I’ll skip over the enormous Constitutional issues involved in the provinces setting up their own firearms registry (quite simply, it falls within federal jurisdiction) and focus on the simpler and more important facet of this debate. Privacy. The above email was written in reference to Census Records, but it is just as relevant to the registry data. Gun owners gave their information to the federal government for a specific purpose as outlined in the Firearms Act. Gun owners did not consent at the time the data was collected for that information to be passed on to any third party. Nobody knows what the provinces would use that information for and there was no consent from gun owners for the provinces to have it. The Toronto Police Service nicely illustrated what they would use the out-dated registry information for: the harassment of legal gun owners. Using the old Restricted Weapons Registry System (which predates the current firearms registry), the TPS went door knocking throughout Toronto (Project Safe City) seizing firearms from citizens who simply fell behind in their paperwork. They went line by line through millions of records to track down these law-abiding citizens – for administrative errors. What an incredible waste of police resources!! If there is no legal requirement to collect the registry data, there can be no legal reason to possess it. The data needs to be destroyed and it needs to be made a crime to be found in possession of it.